Lucia Berlin called many different places home during her lifetime. The following is a list she made in the late eighties detailing the pitfalls of some of them. 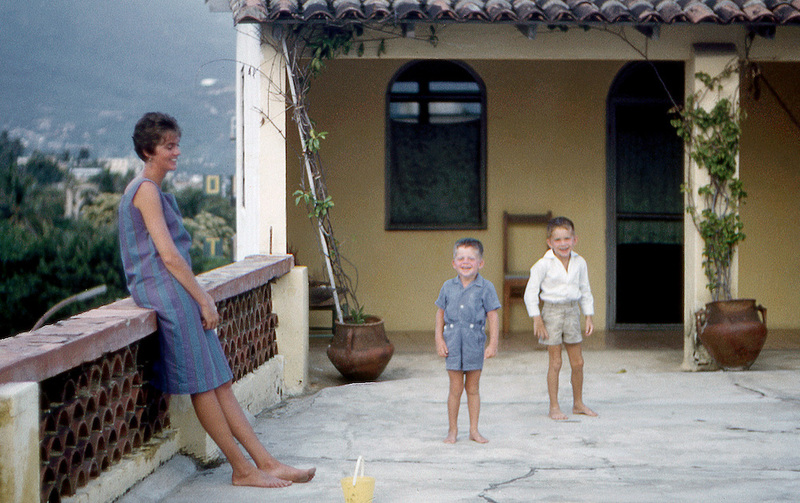 Lucia, Jeff, and Mark, Acapulco, 1961. Photo: Buddy Berlin (© 2018 Literary Estate of Lucia Berlin LP). Juneau, Alaska—Avalanche the day I was born, wiped out a third of town. Deer Lodge, Montana—No heat, just the oven. Earthquake. Helena, Montana—Splinters in the cellar door. Blizzards. Mullan, Idaho—River right outside, too dangerous to play. Mill right by. Stay inside. Flood. Sunshine Mine, Idaho—Paper-thin walls. Mama crying crying. Woodstove smoked. Avalanches. El Paso, Texas—Cockroaches, dark hall, three mean drunks. Drought. Flood. Patagonia, Arizona—Bats got inside, got scared, batted you in the face. Grasshopper plague. Santiago, Chile—Maids, day and night. Earthquakes. Two floods. Rose Street, Albuquerque, New Mexico—Dust storms. Old man died in the apple orchard. Lead Street, Albuquerque, New Mexico—House Edward Abbey had lived in. Only one burner worked. Filthy. Mesa Street by the airport, Albuquerque, New Mexico—Airplanes. Corrales Road, Alameda, New Mexico—No running water, no electricity, no bathroom. Two kids in diapers. Santa Fe, New Mexico—Acequia Madre ditch. Two kids. Thirteenth Street, New York City—Five flights up. Two kids, none walking. Blizzard, all streets closed, miracle. Rothko. Greenwich Street, New York City—No heat after five on weekends. Kids in earmuffs and mittens to go to sleep. I wore gloves to type. Over a ham factory—my W. H. Hudson still smells like ham twenty-five years later. Acapulco, Mexico—Honeymoon. Three weeks of rain. Flood, dysentery, Mark electrocuted, more flood. Edith Street, Albuquerque, New Mexico—Hard water, floor caved in, well went dry. All the neighboring ducks came to our swimming pool. Puerto Vallarta, Mexico—Too many maids, dealers. Fear. Oaxaca, Mexico—Herd of goats next door. Mildew. Struck by lightning on Monte Albán. Yelapa, Mexico—Sharks, scorpions, coconut grove—THUD THUD—three kids. Hurricane. Corrales, New Mexico—Mansion. Three bathrooms. Garbage disposal broke, washer broke, dishwasher broke. Zinnias wouldn’t grow. Roses wouldn’t grow. White House, Corrales, New Mexico—Pump broke, well went dry, wiring blew, chickens died, rabbits died, termites, goat broke leg. Shot her. Rains, cellar flooded, bannister caved in, roof fell in. New chickens died. Princeton Street, Albuquerque, New Mexico—Roof fell in. Evicted. Griegos Road, Albuquerque, New Mexico—I burned it down. Russell Street, Berkeley, California—Eight people, two bedrooms. Toilet overflowed. Sewer line broke. Evicted. Telegraph Avenue, Oakland, California—Broken windows. Police all night. Richmond Street, Oakland, California—Mosquitoes. Police. Fire next door. Evicted. Alcatraz Avenue, Oakland, California—Crazy landlady. Sirens. Evicted. Bateman Street, Berkeley, California—Perfect house, garden. Rains, roof fell in. Sixty-Fifth Street, Oakland, California—Jack in the Box until two A.M.
Woodland, California—Heat wave, candles melted, air conditioner broke. R. too paranoid to open windows until he threw phone thru window when I looked at a man on a horse. Regent Street, Oakland, California—Dark. No light until night, when the neighbor’s floodlight lights my room, like Soledad. I know it’s morning when it’s dark again. Alcatraz Avenue, Oakland, California—No catastrophe. So far. Lucia Berlin (1936–2004) worked brilliantly but sporadically throughout the sixties, seventies, and eighties. Her stories are inspired by her early childhood in various Western mining towns; her glamorous teenage years in Santiago, Chile; three failed marriages; a lifelong problem with alcoholism; her years spent in Berkeley, New Mexico, and Mexico City; and the various jobs she held to support her writing and her four sons. Sober and writing steadily by the nineties, she took a visiting-writer post at the University of Colorado Boulder in 1994 and was soon promoted to associate professor. Her books include Welcome Home, Evening in Paradise, and A Manual for Cleaning Women, which was named one of the New York Times Book Review’s ten best books of 2015. In 2001, in failing health, she moved to Southern California to be near her sons. She died in 2004 in Marina del Rey. Excerpted from Welcome Home: A Memoir with Selected Photographs and Letters, by Lucia Berlin, to be published by Farrar, Straus and Giroux on November 6, 2018. Copyright © 2003, 2005 by Lucia Berlin. Copyright © 2016, 2018 by the Literary Estate of Lucia Berlin LP. All rights reserved.